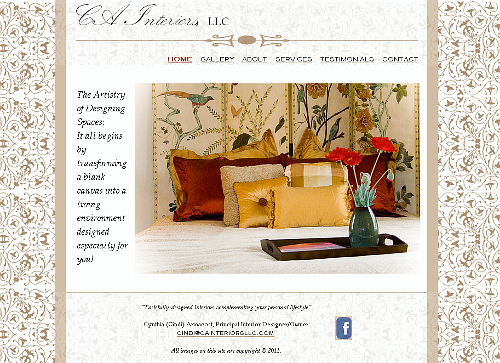 Cindi Armacost contacted me in April about designing her first website. As an interior designer, her website needed to reflect the kind of details that make her work as an interior designer so successful: attention to color, patterns, shape, and architecture. During our first meeting, it was revealed that Cindi's brochures and business cards did not match: her brochures were modern while her business cards were more traditional. Cindi indicated that many people have commented on the uniqueness of her business cards, so we decided to base the website design off of her business cards. In creating the design for this website, I focused on subtle yet intuitive navigation and delineation between the header, content section, and footer. The header and the footer sections are just slightly transparent, allowing a touch of the patterned background to peak through. The navigation is simple: links are indicated by font-styling (small caps) and a subtle beige underline. The fonts used are formal and traditional. After creating the design, the next challenge was creating a gallery to showcase Cindi's work. I based the galleries on Uber-Simple Portfolio, but making the galleries match the design of the rest of the website required a bit of tinkering. Content additions, including adding and editing images for the multiple galleries, came next. This process was made easier by Cindi providing me with content in a timely fashion. The website was launched in June of 2011. In September of 2015, Cynthia joined the firm of Karen Reese Interior Design and asked that her website be retired.